Have you ever wanted to try a Whiskey made in the grounds of an iconic Irish castle? Ok, maybe that never crossed your mind but at least we’ve got your attention now. Slane Castle can be found about forty miles north of Dublin and has recently opened the doors of its first distillery. Since 2015 Alex Conyyngham has been leading a project to turn the horse stables of his family castle into an outstanding Irish Whiskey distillery that relies on a unique triple cask maturation process. While we wait for Slane Castle’s first release of Whiskey distilled in the grounds, the founders decided to release an Irish blend that sets the tone for their new distillery’s future. In this release, Irish Spirit has been matured and blended from Virgin American Oak, Aged Bourbon Oak and Spanish Oloroso Sherry Casks. The combination of these three distinct Whiskey flavors makes this an ideal tipple for anyone looking to appreciate more flavor complexity whilst still enjoying a traditionally smooth Irish character. This is a great example of an up and coming Irish distillery giving you a hint of what’s to come in their bright future. Be one of the first to jump on Slane’s bandwagon and you’ll be saying you had the chance to drink their Whiskey before it was famous. 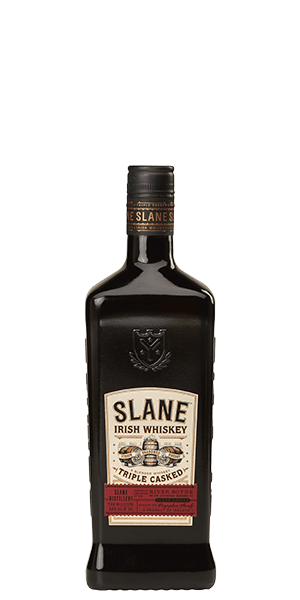 What does Slane Triple Casked Irish Whiskey taste like? The Flavor Spiral™ shows the most common flavors that you'll taste in Slane Triple Casked Irish Whiskey and gives you a chance to have a taste of it before actually tasting it. Freshly baked cinnamon rolls with a hint of orange peel. Honey on burnt toast with subtle spices. Medium in length with stronger spices left dancing on the tongue. To me the orange peel and spice were popping with every taste. Small hints of the port in the finish. One of my favorites so far. Good flavor, great aroma. I don't have much experience with Irish whiskey, but this was a good one. It is now one of our favorite whiskeys . I really enjoyed this Irish. In Ireland, I drank Paddy. This is smoother and had more interesting aftertastes. It was one of the first I've tried, but it was nice. I was able to drink it straight at one point. This has a flavor that keeps of going after the sip. Certainly one of the better Irish whiskeys I've had. This is by far one of my favorite Irish whiskeys. It's smooth and tastes wonderful. It's not easy to find around here but well worth the search. If I could give this 100 stars I would! Amazingly smooth and just about the best I have tasted. Definitely a keeper!! A delicious irish whiskey with a surprisingly complex flavor. Smooth and sweet, can't beat it for the price. Incredibly smooth and sweet. Highly recommend it to anyone that is trying to find “the right whisky”. An excellent Irish whiskey. And you can’t beat this price. Surprisingly good for the cost. Smooth and easy to drink, but not especially complex. I dont have alot of experience to compare it to but I would buy it again. One of the very few whiskey I can actually drink straight. I enjoyed this, I was actually able to drink it straight which is rare for me. I don't have alot of experience to compare it with but I would buy it again. Smooth, needs a bit of water to open it up. Very nice, agree with Jeff this is on the sipping list. For the price this is a great value. I'd buy this again and will savior it for now. On Saint Patrick's Day my friends didn't like this as much as I did. I liked the sherry finish and the very eloquent smoothness. I could sip this one on the regular. Good cigar whiskey. Dominant notes of caramel and dried fruits. The finish is smooth, but not anything to write home about. Surprisingly smooth and flavorful for such a good buy. Rolls easily over the tongue, the sherry refining the spice to a distant shout. I'll buy it again. Smith and taste, light burn. Enjoyed this on crushed ice. Great value and addition to my Irish whiskey collection. Not sure my purest friends would approve on the Irish style but wouldn’t complain on taste. Very aromatic fantastic after taste. The sherry cask really adds a subtle flavor. Great value for the money. Dark honey and orange peel shine through. Very smooth with little bite. Would recommend to someone who doesn’t drink whiskey as an introduction to it.